If you are a DIY/crafter and have not visited ljc’s blog, you’re missing out! This girl can do anything and do it well! She made a ladybug cake that is completely professional looking as well as took a few photos during the making of the cake. Now she posts all her projects at KodakEasyShare, but prior to that she had photos organized on her web site. Take a little time and explore her projects, you will not be disappointed. Speaking of cake goodness, Buzzville posted her lastest in the Martha Cake o’ the Month: a 4th of July-themed cake. And speaking of Martha, a glitter member linked to Shim & Sons Martha-esque birthday party. I especially like the colors of this birthday party because I dream of my kitchen being decorated in red and white, accented with light blue or turquoise. 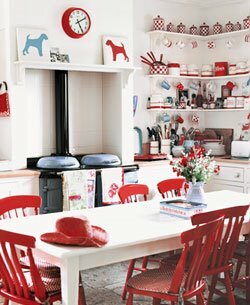 Above, is a photo of Cath Kidston’s kitchen, which I love for all its red, white and blue glory! Hey there! You’ve inspired me to create my own blog, so I was just wondering.. where did you find the codes so you can personalize the look of your page? Awesome, Rae! After picking a template from Blogger, I tinkered with the CSS stylesheets to get the look I wanted and added my own masthead/logo and the right-side menu. I taught myself HTML but http://www.w3schools.com/html is a great resource! The Blogger FAQ is helpful, too. Once you get started, if you have questions, let me know I’ll try to help.